For every dou of grain, 2.5 liang of steam-cake flour, and “cake seeds” 1.5 liang just like the normal way for taking the liquid from un-pressed wine. Add another liang of steam-cake flour. Observe the flavor - is it appropriate? 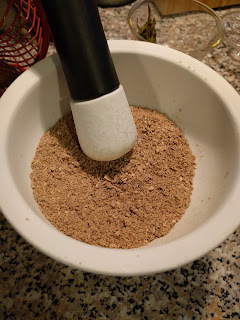 If it’s harsh or hard, then take another dou of cooked grain and add it. If it’s sweet and soft, then with every addition also add yeast cakes and [other] cakes, one half liang each. Wait another three days and it will be done. When fermenting, always be aware of how the brew will expand and contract. The less water you add, the better. This recipe has some problems. There are questions about what "steam-cake flour" and "cake seeds" are, but I think those are just different kinds of yeast cakes, ground up. But worse, where's the honey? The text could be corrupted. It's hard to know if that's the case, so I'm going to ignore that possibility. One interpretation of the text as it stands is that this isn't a mead recipe but a "honey wine" recipe - wine that tastes like, or is somehow otherwise reminiscent of honey. I don't think that's very convincing unless it's unrelated to the author's poem about mead, which is definitely about mead since it mentions bees several times. A possibility raised by my colleague Song Zidie is that the “steamed cake flour” and “cake seeds” contain the honey. “Cake seeds” may actually mean “pancakes.” This strikes me as unlikely, but it’s definitely not outside the realm of Chinese brewing (see: mutton wine). Scroll 7 contains a reference to “steam cakes” that says something like “Some years ago there was a flood in [place] [...] and when the waters receded, [the river] was silted up, and was not able to be deep. It was called “steam cake silt,” and the court hated it.” I don’t see that too much can be drawn from this text, though. Other references to “steamed cakes” really do seem to mean the food, cakes that are steamed, not yeast cakes so I’m confused here. Another interpretation is that I've got something wrong with that first line. It's weird grammatically which might mean that I'm parsing it wrong. Let's break it down. When a character has multiple meanings in A Student's Dictionary, I'll number them, and omit meanings I think don't fit. 作 "3. devise, create, make." I think 予作蜜酒格 is the “topic” of the sentence: “The framework [I use] when I make mead.” Which leaves 與真水亂. 真水 is pretty clearly “pure water” - I don’t see any other plausible readings. 與...亂 suggests “Join x and the following, and mix” but it’s funny diction. There are other words for mix that I would expect in this context (混, 攪 for example). So maybe it’s saying to join the following ingredients with pure water mixed with something? And maybe that something is implied to be honey? It’s a stretch. I’m not sure. 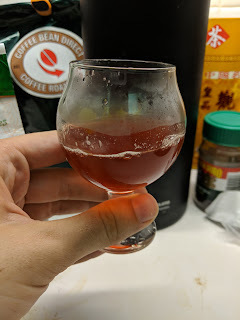 I'm disappointed that this recipe isn't very useful as it stands, but we do have the other mead recipe from Zhang Bangji, so I think I'll start by trying that one out.